Today I’m highlighting some ways of communicating in Moodle.It is useful to remember the different methods available so you can use the right tool for the job. I won’t put pictures up for all the things I’ll discuss below, but I will point you to Moodle Docs so you can learn more about any of these features. Messaging provides an easy way to send private messages between users. In newer Moodle versions there is a messages icon in the top of the screen that tells the user if there are unread messages. Users can add people to their contacts, they can easily search for people by name or by course. The user can decide their own preferences for receiving notifications of new messages when online/offline by mobile or email. This feature is particularly popular with students who use social media platforms already. I would not recommend using this feature for course announcements. In some cases, administrators disable messaging. A versatile feature, forums allow students to communicate between themselves, in whole class or in specific groups, with or without the teacher/facilitator involved. The students don’t need to be logged in at the same time. The group options give flexibility. An example of use could be a competition where groups of students complete a project of their choosing where all must use the same methodology. In this example, I might set the forum to have “visible” groups, so students can talk amongst their group, and they can see (but not interact with) the other groups posts. The splitting of the groups conversations makes it easier for them to track the conversation, but the visibility of the other groups conversations lets them see different ways to use the methodology, so more learning. Optional subscription means students can choose whether they are notified of new posts to forum threads, whereas forced subscription suggests the teacher thinks all students need a notification of new posts. There is an announcement forum for teachers to update their students. This forum does not allow for student responses. The chat is for real-time synchronous discussions. This is particularly useful for courses that are entirely online, to provide a set time that teachers can provide text based support for their students. It is also useful for students to use in groups for planning their projects, or discussing other group activities. Chat times can be published for scheduled times or available for students to make their own times to chat with each other. Chats can be recorded and can be set to allow or not allow students to view the past chat sessions. 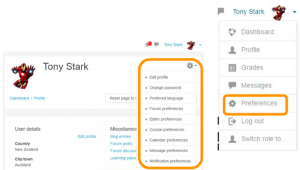 Users have control over how they receive notifications from Moodle. They can choose to receive email digests for example rather than individual emails for every forum posts. It is a good idea to familiarise yourself and your students with these settings. Not always thought of as a communication tool, the calendar does in fact communicate to users events coming up as advertised by the Moodle site, the courses they are enrolled in, groups they are in, or their own events they enter into the Moodle calendar. Similarly the upcoming events block can be displayed in a course with links to calendar events. There is the option to export calendars and import into other calendar programs with an ics file. Some students might for example want to put a dynamic link to their Moodle calendar in their google calendar. This activity provides a way for students to communicate their views about a course or topic (or evaluate their teacher) by answering questions designed by the teacher. Feedback can be anonymous, there can be as many questions as necessary (though I would advise to keep evaluations short) and there is a graphical analysis of the responses automatically created. The new tours feature (Moodle 3.2 or newer sites) allows administrators to communicate changes made to a site with customisable tours. If this interests you, read here. These are not the only communication features of Moodle, but hopefully serve as a reminder that there are lots of options so it’s worth having a good think about which is the right tool for the task. If you don’t know which tool is right, and you have read the Moodle Docs pages, you can try talking with other Moodle users you know. There is also the Moodle community forums as a great place to get help, and they are multi-lingual. Fascinating post Miriam. You are right, there are soooooo many ways to communicate in Moodle, and it’s often finding the best for any given situation that makes’ all the difference’ to the learners experience. I think many teachers rely on one method, possibly the first they find, and don’t explore all the potential options fully, which is a shame really.